Our focus is primarily on the counties of the Bronx, Queens, Brooklyn (Kings), Nassau and Suffolk counties, part of an area known as the "East-of-Hudson" region. This long-overdue logistics shift will have the ultimate effect of significantly reducing traffic congestion, air pollution, public health issues, and infrastructure decay in the region -- all the while increasing public health, improving traffic flow, reducing stress, improving our economy, and bestowing upon us a multitude of other benefits to improve New York's Quality of Life. In a tragic irony, the intense population density, infrastructure limitations, and unique geography of New York City and Long Island make our region more desperate for rail-based freight logistics than any other part of the country, yet we are severely inhibited from being fully-integrated with the national freight rail network. New York City and Long Island receive ~1% of its freight by rail, compared with the ~15% national average. Our goal is to change the numbers in New York's favor and shift freight logistics to a more rail-based strategy. We strive to bring that paltry 1% figure up to match the national average. A tall order? Perhaps. But not so daunting when the right people, armed with the right information, make the right decisions. We are here to serve that information, highlight the problems, offer solutions, and report on progress. We work aggressively to promote freight rail transportation (freight trains) in New York City proper as well as Nassau and Suffolk counties and the entire East-of-Hudson region. We provide the statistics and case studies establishing the solid and undeniable fact that increasing our reliance on freight rail logistics is the answer to many of the region's transportation, infrastructure and public health problems, among many other issues. Rail New York strives to grow the freight rail sector in New York City and geographic Long Island by furnishing unbiased facts to the public, politicians, municipal agencies, business leaders, institutions, and other policy-makers to build support for freight rail transportation so as to make it a more integral part of the East-of Hudson's freight logistics strategy. Everyone will benefit. 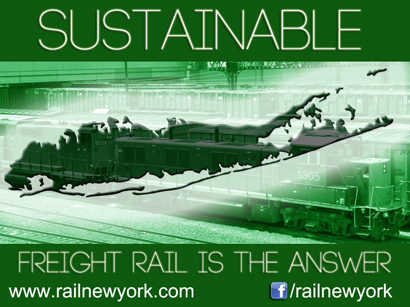 New York and Long Island absolutely require freight rail to survive today and to be sustainable in the future! Rail New York (RNY) was established to be a champion of freight rail in New York City and Long Island, and we are proud to be a pro-freight rail group in a city and region where freight rail transportation (freight trains) are incredibly uncommon compared with other parts of the country. The founding members of RNY realized that a group promoting freight rail was completely lacking in the debate surrounding the New York region's future transportation needs, and we are here to serve the facts, inform the public, and make a solid case to establish the benefits of freight rail logistics. In a humorous twist, RNY owes its existence to the anti-rail group CURES, an extremist NIMBY ("Not In My Back Yard") group in Queens that vehemently opposes expanding New York's freight rail sector at all costs, and at the expense of the approximately 21 million people living in the New York City metropolitan area. To counteract the lies and scare tactics that anti-rail groups such as CURES utilize to slander freight rail transportation, RNY was established to be a champion of freight rail in the East-of-Hudson region. It is our mission, and our civic duty, to tout the benefits of shipping freight by rail and - more importantly - how increasing freight rail logistics in New York City and Long Island will improve the Quality of Life for everybody in the region. Simply by browsing this website, you will find the benefits of freight rail to be an absolutely undeniable fact. Freight rail transportation is the greenest, most environmentally-friendly, and most efficient way to move cargo. Freight trains are the solution to many of the challenges New York City and Long Island face; an inarguable fact beyond debate. Here's a simple tidbit to whet your appetite: Did you know that one railcar in a freight train removes FOUR semi tractor-trailers from the highway system? Think about that... just think about the possibilities and how much easier your commute home would be. Your standard 75-car freight train removes almost 300 semi tractor-trailers from the highway. Stunning, isn't it? Imagine even longer trains. Now imagine even more trains, and longer ones at that. We are committed to making this a reality. 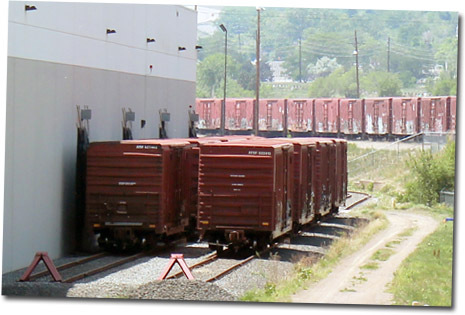 One boxcar can carry the load of 3 to 4 semi tractor-trailers, and a single freight train can carry one ton of freight over 400 miles on one gallon of fuel. Best of all, freight trains won't clog the highways and will not adversely impact the East-of-Hudson region's Quality of Life. 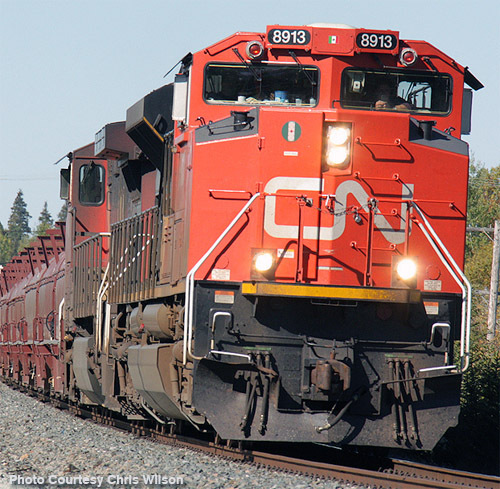 Freight trains ARE the answer to our worsening problems. Purely through web-based mediums such as this website and our Facebook page, Rail New York exists to educate the public on the multitude of benefits that freight rail transportation would provide the NYC/Long Island region if this transportation mode was more aggressively promoted by politicians, enhanced with improvements, streamlined for efficiency, and expanded for higher capacity. As the population of geographic Long Island increases, the goal of importing and exporting goods and commodities to the island becomes ever more daunting when you consider the limited number of roadway bridges linking the island to the mainland United States, exacerbated by population growth projections. Something must be done, and freight rail absolutely must be part of the answer - a very large part. We are here to make that case. The facts supporting freight rail are overwhelming, proven and indisputable, but our target audience is a population largely unaware of the benefits of freight trains by virtue of New Yorkers not seeing freight trains on a regular basis; freight trains are largely missing from the landscape. We serve to make these facts readily available to New Yorkers, for the benefit of our beloved city and those who live within and around it. With an open mind, we invite you to read the content of this website, contemplate the issues, envision the solutions, and realize that increasing freight rail in NYC/Long Island is a major step forward towards reducing traffic and air pollution, reducing wear and tear on the region's infrastructure, and improving public health and our Quality of Life. After considering the facts, we hope that you will ultimately help us in our cause by supporting freight rail transportation along with us; you can be very instrumental as we mount pressure on politicians and business leaders to make our demands for increased freight rail in NYC and Long Island not only heard, but acted upon!